Towards the end, I felt sorry for the other mother though. All she wanted was a little girl of her own, one she could love, cook for and sew button eyes on. Exactly! Except for the fact that she wanted to sew button eyes, I found nothing wrong about other mom.I found Coraline a bit confusing. I couldn’t quite figure out what Gaiman was trying to convey. Maybe he just wanted to write a scary story, and I’m trying to find a message where there is none. What?! You did all of that? Now this is creeping me out. Yes, that will be one scary story, when you write it. – I can quite imagine a girl with a mad gleam in her eyes, wielding a knife (what was the instrument used?) in one hand and a dolls head in the other. I’m reminded of the small girl in Crooked House. 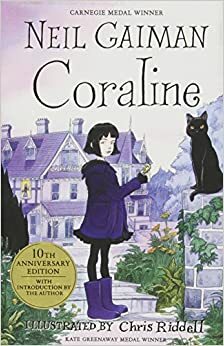 I think Coraline was one of those books that the author just writes and takes it as it goes without an actual plan, and then leaves it open to interpretation. It has been a fairly long time (since this post), hasn’t it? Don’t feel compelled to do something when you don’t feel like it. These phases come and go. Hope you’re safe and fine in Chennai? Quite a horrifying read – I cannot imagine how it must’ve felt. Take care. Is it OK to ask, “Are you alive?” ? PS: No, you need not post any reviews. Ha – happy to know that! Thanks for the recco, The Visitor. I’m ticking this off my reading challenge now. Ha! “Ticked off and out of my book blogger life” would have been more correct. PS: I am known for being the drama king. Hey – are you seriously signing off? I’m trying to fold everything I have into a novel. I want to be a secret. I can’t disperse myself on Twitter. – A quote from an interesting article / interview that I read yesterday.